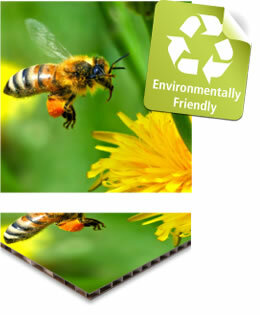 A sustainable, 100% recyclable lightweight display board with excellent print quality, this board has two smooth faces with a sturdy honeycomb shaped internal support structure. It is ideal for point of sale or large displays where weight may be an issue without compromising on strength. These type of boards are available in a variety of sizes and all are the perfect environmentally friendly large format print solution.